Welcome to the Cambria, a lovely 1835 sq. ft home with a California-style stucco exterior. 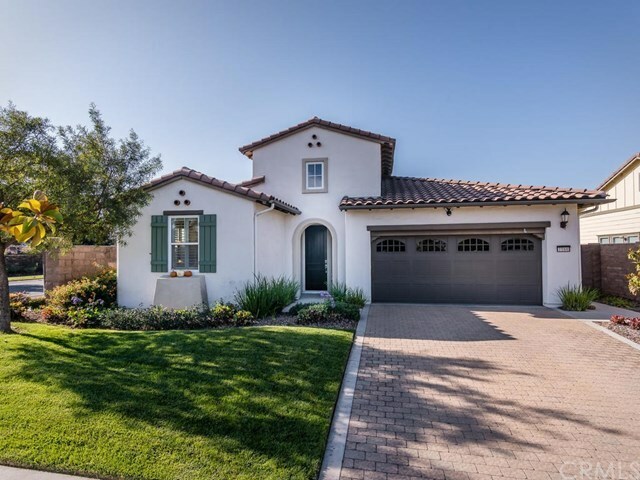 Built in 2011, this 2 bedroom plus den, 2 bath owned SOLAR home features a highly-desirable open concept floor plan with travertine-tiled floors, plantation shutters throughout and a unique double-sided fireplace. The centrally-located gourmet kitchen offers rich walnut cabinets, stainless appliances, granite countertop and island, a butlerâs pantry complete with beverage cooler and an adjoining breakfast nook for casual dining. Thereâs even a row of glass-front walnut cabinets to display your treasures. The main living room off the kitchen features a cozy fireplace with additional storage. The second side of the fireplace adds a warm touch to the formal dining area. Across the way youâre welcomed with beautiful glass French doors leading into the office/den. The master suite is truly inviting with its large walk-in closet, extra linen storage, double vanity and spacious tiled shower. Thereâs even a French door that leads out to the nicely-appointed backyard, complete with a relaxing raised spa. In addition, thereâs a guest suite at the front of the home which includes a full bath with a combo tub/shower, and the laundry is located near the kitchen for the ultimate in convenience. Best of all, this beautiful home is located in Trilogy so you can live the lifestyle of your dreams. Directions: 101 to Tefft. West on Tefft. Right on Mesa. Left on Saguaro and house will be on the corner.